The Academy of Motion Picture Arts and Sciences filed a trademark infringement lawsuit against the marketing firm who created the $200,000 gift bag for 2016 Oscar nominees. Nominees would be given luxury goods at the Oscar ceremony, along with some provocative offerings like Vampire Breast Lifts, marijuana tobacco vaporizers, condoms and laser skin-tightening procedures. The Academy’s lawyers wrote a letter to the marketing firm, Distinctive Assets, after becoming concerned about the confusion that the gift bags have nothing to do with the Academy. The Academy is a non-profit organization dedicated to encouraging excellence in motion picture filmmaking. Every year the Academy presents the Academy Awards of Merit known as the Oscars or Academy Awards to recognize outstanding achievements in the film industry. The Academy owns trademark registration for OSCAR, OSCARS, ACADEMY AWARD, and ACADEMY AWARDS and ensures those trademarks are only used in connection with the award ceremony. Distinctive Assets is a specialty marketing business that focuses in celebrity placement by promoting products of third parties through gift bags to celebrities who attend or are nominated for award shows. The Academy has no connection with Distinctive Assets, does not endorse its products, and has not granted Distinctive Assets permission to use the Academy’s trademarks to raise the profile of its gift bags. Nevertheless, Distinctive Assets has referred to its gift bags in tweets as “Everyone Wins At The Oscars®! 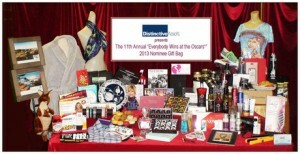 Nominee Gift Bags,” and “Everyone Wins Nominee Gift Bags in Honor of the Oscars ®.” A variety of news outlets have discussed the Oscars in connection with Distinctive Assets gift bags. For example, Glamour magazine said “the 2016 Oscars might be the Academy of Motion Picture Arts and Sciences’ swankiest ceremony to date if this year’s gift bag has anything to say about it.” These mistaken impressions are passed onto the public rapidly expanding the confusion Distinctive Assets has created among Oscar goers. Distinctive Assets’ confusing promotion of the infringing gift bags unmistakably infringes upon the Academy’s trademarks and is likely to dilute the Academy’s trademarks. beginner blog writers? I’d really appreciate it. Having read this I believed it was really informative. I appreciate you finding the time and effort to put this information together. Leichtkrafträder von 255 × 130 mm vor. Daten einer prospektiven Untersuchung mit Prednison sowie anschließender Metaanalyse ergaben eine Odds Ratio von 3,4 für diese Gestalt der Fehlbildung. Und sodann fällt mir die schiefe Naht auf. three. You will get your degree in many different ways. Utilizing knowledgeable monetary company is one of the simplest ways to search a wide variety of loans.